This article is written by Mr. Venkatadri Brahmandam (Venkat from HF). 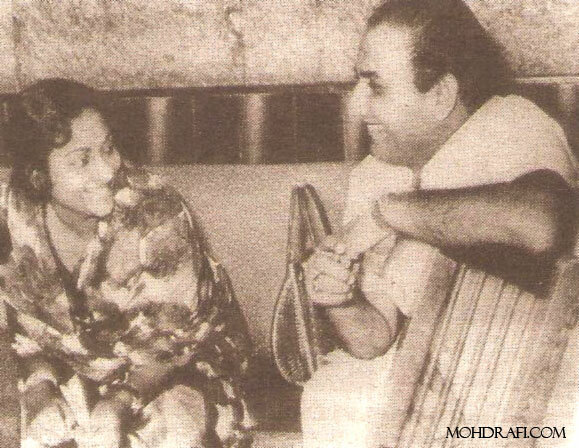 Geeta Dutt had sung over 150 duets with the great Mohammed Rafi, her highest number with any singer. Now, Mohammed Rafi, the singer-par-excellence, needs no new introduction. He was a colossus that ruled the Indian Film Music for over three decades all the way unto his untimely death in 1980. Even after his death, he was continuing to eternally rule the hearts of genuine music-lovers of successive generations. Almighty God had blessed Mohammed Rafi with a Voice that could modulate and mould itself horizontally and vertically, so effortlessly and at will. That was a Voice which could express a hundred emotions so beautifully, be it pathos, love & romance, despair, frustration, patriotism, devotion, courage, determination, mischief, comedy, mock, philosophy, preaching, etc. No wonder, most Legends, be they Music Directors or co-singers, be they his contemporaries or of later times, always eulogize(d) him with so much sincere passion and never tire(d) of pronouncing him as the best singer of all times. Geeta Dutt had combined with Mohammed Rafi so very well to give us scores of memorable duets. By the way, there is a fundamental difference between Geeta Dutt and Lata Mangeshkar. Lata Mangeshkar, with her conventionally beautiful voice, makes a huge impact on the listener instantly. Geeta Dutt, with her nasal tinge and peculiar intonation, takes a while to impress the listener and to grow upon him/her. As one music critic had said, Geeta Dutt is Thandi Hawa and Kali Ghata rolled into one. She was completely and equally at ease with heavy, tear-jerking numbers, on the one hand, and naughty, seductive teasers on the other. People first took note of the effectiveness of Rafi-Geeta combination, in a group song of Geeta, Rafi, S.D.Batish and others in Film: Hamari Manzil(1949), “Katen Banenege Kaliyan Katon Se Khelta Jaa“, composed by Husnlal Bhagatram. But, when one speaks of Geeta-Rafi duets, somehow one automatically thinks of O.P.Nayyar. For it was O.P.Nayyar’s Film:Aar Paar (1954) that had delivered the first big-ticket duets of this duo. “Sun Sun Sun Sun Zalima“, “Are Na Na Na Na Aisa Tauba Tauba” and “Mohabbat Kar Le Jee Bhar Le“. This great, lively and peppy association of these three greats, OPN, Geeta and Rafi went on for many Films, Mr. & Mrs. 55 , Musafirkhana (1955); Bhagambhagh, CID, Choomantar, Mr.Lambu, Shrimati 420 (1956); Bade Sarkar, Johnny Walker, Main Baap, Ustad (1957) and 12O Clock (1958). After 1958, O.P.Nayyar, for reasons musical and not-so-musical, had gravitated towards the equally talented, but more aggressive, Asha Bhosle. Geeta-Rafi duets under S.D.Burman are much fewer in number. But, one gets the feeling of a far higher number because some of those are of real sublime quality, such as “Ham Aap Ki Aankhon Mein” from Pyasa (1957), “Rimjhim Ke Taraane Leke Aayi Barsaat” from Kala Bazaar (1960), “Chupke Se Mile Pyaase Pyaase” from Manzil (1960), “Bataavo Kya Karungi Main Jo Gham Ki Raat Aayegi“, from Ek Ke Baad Ek (1960), “Tu Ne Le Liya Hai Dil, Ab Kya Hoga“from Miya Biwi Raazi (1960), etc. Coming to Chitragupta, one is bound to be surprised that it was he who had created the highest number (25) of Rafi-Geeta duets. And some real good ones too, such as “Ho Chat Mangni To Pat Shadi” from Chaal Baaz (1958), “Kabhi Toh Haan Haan Kaho Na” from Son Of Sindbad (1958), “Jawaab Nahin Gore Mukhde Par Til Kaale Ka” from Kangan (1959),) “Teri Nazar Mein Main Rahun” from Band Master (1962), etc. Chitragupta’s Rafi-Geeta duets used to be of the traditional semi-clasiical or folk type until around 1957. Thereafter, it appears Chitragupta was inspired by O.P.Nayyar’s successful and fast-paced Rafi-Geeta duets and thus he too went on composing fast, peppy, western-type duets with Rafi and Geeta. Coming to N.Datta, who can forget his “Tum Mile Woh Din Dhale” from Dr. Shaitan(1960) and “Awara Abdullah Yeh Pyaar Ka Halla Gulla” from Awara Abdullah(1962)? Even some very lesser-known Muisc Directors have contributed their own memorable duets with this great duo. A case in point is the pathos-laden duet by Music Director, Jimmy from Film:Payaar Ki Baazi, “Humein Pyaar Karne Na Dega Zamaana” even as late as 1966!! Johnny Walker has the highest number of songs for any comedian-hero, a large proportion of which are even duets! No other comedian has this distinction. And as we are well aware, Rafi has a total monopoly over songs/duets featuring Johnny Walker. Geeta Dutt, in turn, had the distinction of partnering Rafi in almost all the duets featuring Johnny Walker, barring very few. While some 80-90 duets of Rafi-Geeta are better-known and popular, there are another 50-60 of them that are relatively rare, but are as good as some of the more popular numbers. Let us fondly recall some of these rare duets. One is bound to enjoy the fresh voices of the two legends in this vintage number, with a lot of nostalgia. This is the title song of the Film and is a very nice and peppy duet. Again a very rare use of Geeta Dutt by SJ. Yet another peppy and lively duet. Another beautiful, pathos-laden song and an excellent rendition by both the legends. Another nice duet in the comedy-genre, picturised on Om Prakash. A very nice and peppy duet based on Punjabi folk , quite unusually from Ram Ganguly. This one is a real beautiful number, composed in OPN style by Geeta’s brother, Mukul Roy, and picturised on Johnny Walker. The Mukhda tune is bound to remind you of the old English song, “Let’s Play the Game of Love”! Another real nice and pleasant number picturised on Vijay Anand and Shakeela. Notice the soft yodeling by Rafi Saab in this duet. Another nice comedy number picturised on Mohan Chhoti and Helen. One more lively and peppy duet by Rafi and Geeta. A very nice duet and a familiar one to Vividhbharati regulars. Both the singers render this with great energy and josh. Yet another lovely and fast beat song. This is one other lovely, lively duet picturised on Raj Kumar and Shyaama. A familiar one to old-time, radio listeners. One more very good duet from Film:Panchayat. Yet another rare and nice duet. Another very nice duet by the duo picturised on Johnny Walker and Kumkum. This 1:44 duration clip from Film:Pyasa is indeed a very rare, collectors’ item. It was quite common for great MDs such as SJ and SDB to compose one musical bit or the other in one of their earlier Films and use the same bit for a full-fledged song in one of their subsequent Films. Similarly, if you hear the prelude accordion music of this rare Pyasa duet, you will notice that the duet, “Chup Ke Se Mile Pyaase“, from Film:Manzil(1960) was inspired by that prelude accordion bit. Secondly, listen carefully to that “La La La La La Lala Lalla” bit in it and you will remember the “Hay Yeh Nigahen” song from Film:Paying Guest(1957). In addition to the Rafi-Geeta duets listed above, there are many more rare and nice Rafi-Geeta duets under O.P.Nayyar, Chitragupta and N.Datta too. A great Rafi-Geeta duet. Listen to the “Jaaao Ji Maaf Kiya, Ham Ne Insaaf Kiya” part and you may notice shades of Lata’s “Jiya Beqarar Hai, Chhayi Bahar Hai” from Film:Barsaat(1949)! Oh, what a duet! Great composition by OPN and great rendition by Rafi and Geeta! Another great trio by OPN-Rafi-Geeta!! A â€˜must-listen’! A real old-world melody sung so beautifully by the duo. Yet another melodious number of the early fifties type. A real great duet by the duo and a great romantic composition by Chitragupta. Another pleasant, peppy and stylish duet by Rafi-Geeta. One other peppy, fast beat, Punjabi folk song by the duo. Yet another great trio by Rafi, Geeta and Balbeer. A nice duet picturised on Johnny Walker. The Mukhda tune of this duet was inspired by the Mukhda tune of another 1955 Lata song, “Tara Rara Ram Mere Dil Mein Sanam” from Film:Hoor-e-Arab(1955). A nice Punjabi folk- type duet. Yet another nice duet picturised on Johnny Walker. Not much is known, however, regarding the personal relationship and equation between Geeta Dutt and Mohammed Rafi. But, it is safe to surmise that they both shared an excellent working relationship. A straight and simple relationship, so unlike the ones that Rafi had with the two big sisters. Actually, it must have been quite a task for any female singer to partner a Rafi Saab, who would frequently be deploying his Adayen and Harkatein, at will. 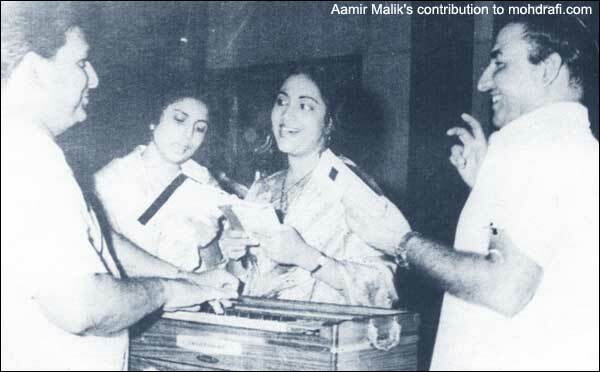 It was required of the female singer to sing with a straight face in the midst of these Rafi harkatein. Take the example of the beautiful Geeta-Rafi duet “Legaya Dekho Dekho Dil Bhi Hamara” from Film:Samundar(1957), composed by Madan Mohan. In this duet, what strikes one as cute is the way Geeta Dutt keeps singing her lines in right earnest, while Rafi Saab keeps saying his intoxicated/drunken lines, which can easily unsettle the co-singer. Another example of this kind is seen in Film: Shrimati 420 (1956). The peppy duet is “Ham Ko Chod Ke Kahan Jaavoge, Saiyan Tum Bada Dukh Paavoge“. In this one, Rafi Saab has just interventions of the “Achha“, “Ahha“, “Ohho” type!! All in all, Rafi and Geeta were a great duet pair who had given to music lovers some wonderful and unforgettable songs. This entry was posted on Sunday, December 7th, 2008 at 12:59 pm	and is filed under Meri Awaaz Suno. You can follow any responses to this entry through the RSS 2.0 feed. You can leave a response, or trackback from your own site. Superb site, worth Gold just as all the songs and their makers and singer are. I don’t know how to thank this site for displaying the rare pics (in one of them I vitness when workg with Guru duttjee during AARPAAR). venketgi, ur article impressed me to a great extand.in the above mentioned songs i had not heard 90 percent of it. how cold i collect all these songs and duets of geet- rafi team? dear venkatji,very colour ful article! i had heard only a few of of the songs mentioned by u . i rally wish if i could hear the the remaining songs and duets of rafi-geeta pair especially music performed by ram ganguly,vasant desai, madan mohan, mukul roy, hansraj behl,sdb and n dutta & chitragupta .if my memmory is correct rafi and geeta had done a beautiful comic song under the baton of k/a the lines begins with” mai hum pappa khan… madame bil bilan ” , the filim is not known to me. The mystery man is none other than â€¦ â€¦.. ? This mystery man created Guru Dutt, who in turn created Waheeda Rahman, Johny Walker & Rahman. This mystery man knew & understood the potentialities of â€¦.. â€¦.. ? and helped him to become the greatest directors our Indian Film Industry has ever produced. post 26 and post 27…. please do not talk of real “ungrateful” people in the realm of h f m .
if ever one would list, then asha would head the list “only” for one reason. for bad mouthing our music legends. she once mentioned to a journo that OP NAYYAR is a very ordinary music composer compared to rd burman. she forgot that when even the elder sister made her sit at home, it was the indomitable and sher of punjab opn who brought out – and gave her matching songs along with mohd rafi. if asha was made a singer its because of only two powers – god itself first and then the god of music – op nayyar. the world recognises this fact but not asha – whose 75% songs are to be heard from one ear and taken out from the other. these include the songs lip synched for our padmashri winner helen, bindu, padma khanna, jayshree t. leena das, many other vamps and the many b nd c grade artists of the land. the letter of pmc blamed two legend singers ie shamshad begum and asha.if it is true,ofcourse it is a great mistake and undecent work on the part of shamshad and asha. in 1950’s & 60’s rafi sab had sung so many sweet & popular songs with shamshad.similarly in her helpless begining stage it was op neyyer who protected asha by giving so many songs ,op even avoide geeta dutt for asha. in a vishesh jaimala programme of vivid barathi in early 1970’s geet dutt played many rafi sab’s songs.it includes a goonje ki galiya.. kahahai kahahai (filim pyasa) na kisee ki ang ka nooru hum (filim lal qillah)and some of her duets with rafi.in the same year shamshad begum also presented such a visheshal jaimala programme.but in that one hour programme she had not played even a single song of rafi,instead she played two duets of with kishore. (shamshad had shared more than hundred songs with rafi sab.) this incident is equal to that of asha bosle, in vishesh jaimala programme she had not played a song of op nayyer sab. i adorned both these singers and mds mentioned in the article.both of them were highly photo genic and ownerers of melodious voice. Ref. Post 21, 22 and 23. Is that mystery man ABRAR ALVI? If not, I give up and you need to spell it out. If sd was an eccentric, op was a maverick. I thought you’d be able to identify the mystery man. Think of the person who is connected to guru dutt, sd, op, sahir, geeta, asha, pyaasa, kagaz ke phool and howrah bridge. In Act 1, I am sure you were referrring to Guru Dutt, SDB, Sahir Ludhianvi , Geeta Dutt and Wahida Rehman. In Act 3, you were referring to Sahir trying to hog the credit for Pyaasa and also saying that SDB was a success because of himself, ie. Sahir. So, SDB had stopped working with Sahir. But, who is the other MD here, who dropped Sahir from 12 Films!! Need your clarifying input. In Act 4, you have referred to OPN giving up on Geeta Dutt and getting closer to Asha Bhosle, mainly from the days of Howra Bridge-1958. Of course, earlier than 1958 too, OPN had used Asha in a few Films such as Musafirkhana, Naya Daur, Bagham Bhagh, etc., but Asha then was still not his lead female singer. Incidentally, what a great song that Rafi-Asha duet you have referred to! “Mohabbat Ka Haath, Jawani Ka Palla, Subhanallah Babu Subhanallah”! I have a balck and white video of OPN and Qamar Jalalabadi making Rafi Saab and Asha reherse this duet!! Finally, the ultimate mystery and suspense is on your last sentence regarding one personality who witnessed all these events!! Who could that be? Is it Mr. Murthy, the regular cinematographer for Guru Dutt? I went on reading again and again that mystery-thriller of a post from you. Highly thought-provoking, indeed. Please give me a day to mull over it and formulate my comment. Here’s my spin on it, for whatever it’s worth. Act 1, circa 1956. Three personalities: an actor-director who dreams of creating poetry on celluloid, a poet whose talent surpasses even his towering ego, and a music director who is known for his eccentric ways. All three much ahead of their time. Into this mix enters a singer with beautiful eyes and an enchanting smile, and an even more intoxicating voice. And an actress whose beauty can make anyone dance to her charms. Act 2, circa 1957: The film is being made. The actor plays the role of a poet, the protagonist in the film. No matter how sublime his poetry is, the poet is ostracised from society by vested interests and surrenders himself to the “aaj sajan mohe ang laga lo” advances of a fallen woman from the red light district of Kolkata. Act 3, circa 1957: The film gets released. Word gets around that the poet-lyricist has been telling people that he has “made” the music director, who in turn stops working with him after a strong association of over seven years. But the main surprise is that another music director, who has no connection with the film whatsoever, decides to stop working with the lyricist and drops him from 12 films that has been already signed. Act 4, circa 1958: The actor-director is in love with the actress; the singer laments “waqt ne kiya kya haseen sitam” and the action moves from the red light district of Kolkata to Howrah Bridge. A lot of water has flown down the Hooghly in one year. The other music director who enchanted music lovers with his peppy tunes sung by this beautiful singer starts looking elsewhere. After all, it is “mohabbat ka haath jawani ka palla”; all you can say is “subhanallah”. Act 5, post-1958: mera sundar sapna beet gaya… little did she know that when she touched everyone’s hearts with this great song more than 10 years ago, her real life would slowly start resembling the reel life she portrayed so vividly. One personality witnessed all these events. But being a private person, he never said anything. Good article. Could you highlight the hamar forum details of your contributions – all articles pl. Thanks for you response. I am sure you will present what you have said. Indeed I observed your articles in hamara forum as well, very informative and rare melodious songs are presented by you. Great research sir. Indeed, on the other day I was going through one hamara forums wherein your fine taste of appreciating articles was noticed by me in the telugu field also regarding the great & incomparable ghantasala songs as well as his padyams in the hamara forums. Pl. accept accolades. Many sincere thanks for your kind appreciation. Some of you have expressed your desire to possess and listen to some of these rare Rafi-Geeta duets. In due course, I will present some of the beter ones among those, in Audio Songs feature on this website. If you want to really possess the rarest of rare Rafi songs, let me assure you that the only route is to become an Angel member in Hamaraforums.com. It is a veritable treasure not only for Rafi songs, but for all HFM starting from the thirties and forties. I myself have built up most of my collection in Hamaraforums.com. Just stated a matter of fact as I firmly believe it. Not meant in any way to publicise Hamaraforums. Very nice informative article by the knowledgeable Mr.Venkat. Makes us feel that we should hear these songs at once. Reading more about Rafi saab only increases our admiration towards this greatest son of India. Congratulations for writing a great article Venkatji. You have done a great job of research and homework.There was a great chemistry between Rafi Saab and Geetha Dutt and the duets picturised on Jhonny Walker are unforgetable and evergreen.It is pity that many of us have not heard many of the duets that you have mentioned.How do get to hear them and possess them?.In all the photographs Rafi Saab is the ever smiling jovial person.It’s a pity that both Geetha Dutt and Guru Dutt died early.Otherwise the world would have got many more beautiful songs. Please consider writing many more informative articles which would be of great help to all Rafi Fans and enlighten us on many wonderful aspects of Rafi Saab’s personality. Great article by Venkatadri, abt the duet songs of rafisahab with geetadutt. In all gurudutts films rafisahab sang many songs with geetadutt. really great, i want to request Bijoorji where r u staying, can u give me the contact number. Good article. A splendid effort to bring out the not so easily available combination of geeta-rafi. Generally, lata-rafi combinations are remembered to a maximum extent. This kind of article surely brings about the great rafi’s partnership with other talented female singers. Similar article for songs between asha-rafi would be appreciated by knowledgable personality like you venkatadri ji. Post No. 7: Mistakenly I attriduted the female voice in chorus song from ‘Goonj Uthi Shehanaai’ (Haule haule ghoonghat pat knole…) to Geeta Dutt. The song is sung by Lata and Rafi and not Geeta & Rafi. The error is regretted. Best complements of the day. I am looking for this rare duets of Rafi-Geeta Dutt , Venkatji or someone having in MP3 form please mail to me. Another sixer. In America we call it another home run. An excellant article with lot of information. You did lot of research and presented such a beautiful and great article. Congratulations! what a great article! thank you so much for taking the time to write such an informative article. you’ve highlighted so many beautiful rafi-geeta songs. And by looking at their picture together, you can see the chemistry they shared. Great article with so much depth. This article contains few rare songs which I have not listened before. Many thanks or sharing them. great article , great pair & great duets. thanks a lot for sharing of rare songs of this combinations. “Ankhon Ki Ankhon Mein” from CID and “Rimjim Ke Tarane” from Kala Bazaar by Rafi-Geeta Dutta are my favorite. O.P.Nayyar composed lot of hit songs of this combinations which are still popular. The song mentioned in this article are everlasting. Long Live Mohd Rafi-Geeta Dutt Duets.